All Star Flags has a high-quality Air Force flag for sale below. The Air Force flag for sale below is fully dyed for great outdoor performance. Four rows of stitching on the fly end make our Air Force Flags durable in all conditions. Air Force Flags are finished with a canvas header and two brass grommets. All our US Air Force Flags are proudly made in the USA. Fourth in ceremonial order, the USAF flag features the Air Force coat of arms on an ultramarine blue background. It is surrounded by 13 white stars that represent the thirteen original colonies. Above the coat of arms that is the Air Force crest, a bald eagle whose wings frame three stars to represent the three branches of the National Defense establishment, which are the Army, Air Force and Navy. This US Air Force flag was approved in 1951 and has not changed since. The official US Air Force Flags are made 4 feet 4 inches hoist by 5 feet 6 inches fly and trimmed with 2.5 inch gold fringe. They are dressed with campaign streamers when displayed in presentation form. Just beneath the crest is a scroll with yellow text reading "United States Air Force". The colors of the USAF flag and seal are ultramarine blue and yellow/gold which are consistent with the transition from the earlier Air Corps organization into the modern Air Force. The seal features an American Bald Eagle as the centerpiece, representing the symbol of the United States and air striking power. A cloud formation is positioned behind the eagle representing the beginnings of a new firmament (sky). The eagle sits perched on a wreath made up of six alternate folds of silver and blue. The shield is divided with a nebuly line (wavy - representing clouds) with blue on top and white filling the bottom of the shield. On the blue portion of the shield is a thunderbolt image that epitomize the striking power from the air. All Star Flags has the official Air Force flag for sale here! 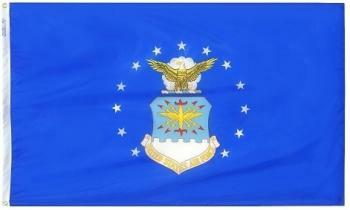 Air Force Garden Flag - Nylon - 12x18"